U.S. job growth rebounded sharply in April and the unemployment rate dropped to 4.4 percent, near a 10-year low. 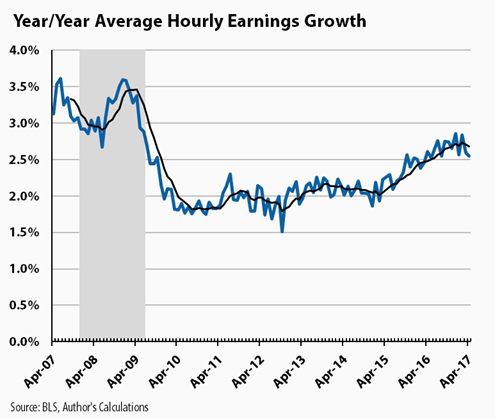 April's job growth, which was broad-based, surpassed this year's monthly average of 185,000. The drop of one-tenth of a percentage point in the jobless rate took it to its lowest level since May 2007 and well below the most recent Federal Reserve median forecast for full employment. The report offered a snapshot of an increasingly solid economy. The U.S. labor market is still expanding at a steady clip even after 79 straight months of job gains, helping to heal much of the damage still lingering from the recession. Job gains were seen in mining and manufacturing, sectors that are relatively small but have been closely watched with the new administration's vows to boost employment in industry. "This steady and sustained increase in job creation equals new paychecks for American workers and income for American families," Secretary of Labor Alexander Acosta said in a statement on May 5th. "Nonetheless, we have challenges ahead as we continue to focus on job growth, on bridging the skills gap and on expanding opportunity for all Americans." During the stubborn recession, it was more difficult to cost-justify purchasing AGVs (automated guided vehicles). Manufacturers could legitimately argue that despite the efficacy of automation, labor was inexpensive and widely available. All of that has changed. The costs of labor are nearly double per hour versus 2007; the current national manufacturing average of $25 per hour according to the BLS, Bureau of Labor Statistics, does not include health insurance, workers' compensation, and other required OSHA training costs. Adding to the complexity of the workforce is the aging-out of skilled labor. While the unemployment rate is low there are over six million unfulfilled manufacturing jobs. There is a mismatch of skills possessed versus skills needed. Robotics solutions are going to make up a larger and larger share of jobs that go unfulfilled. Manufacturers are investing in AGVs to improve plant-floor efficiency and reduce operating cost. Due to the high cost of entry, automated guided vehicles were only found in warehouses, automotive assembly plants, and other operations with large amounts of floor space. Low unemployment combined with recent advancements have made the machines more appealing to small- and mid-sized manufacturers in a wide variety of industries. As the flexible technology is now more affordable and easier to use on assembly lines, many smaller manufacturers and single location distribution centers are deploying driverless carts, robotic parts bins, and autonomous tuggers. Manufacturing engineers have best-practice lean manufacturing solutions which are driving prices down making these solutions available to everyone. Today's AGVs are more advanced than what was available a decade ago. The machines are now faster, safer, easier to program, more precise and less expensive. Better throughput, productivity, and cost-effective technology are now available to even the smallest manufacturer or distributor who have been ignored for far too long. With e-commerce exploding and customer expectations on the rise, distribution and fulfillment centers as well as third party logistics (3PLs) providers need an innovative way to reduce costs and increase throughput. Low-infrastructure solutions to automate material handling needs includes case picking, each picking, goods-to-person, person-to-goods, and robot-conveyor hybrid systems. Full employment, in macroeconomics, is the level of employment rates where there is no cyclical or deficient-demand unemployment. It is defined by most mainstream economists as being an acceptable level of unemployment somewhere above 0 percent. Respecting the value of the small manufacturer is obvious yet most in the automation arena have ignored, even dismissing the value of these small manufacturers, each of whom can derive the same benefits from full automation. Fully automated operations have a long way to go.